Look. Up in the sky! Is it a bird? Is it a plane? No, its, Christos Gage, Neil Googe, and Brett Booth, rapidly falling in our direction! Quick, DC Comics! Run like f*ck! Or else they will all slam right into us, in January, 2014. SPPPLLLAAATTT! Ops! Too late. Don't say I didn't try to warn you! To QUOTE Amelia Earhart: 'The most effective way to do it; is to do it'. On a purely conceptual level this stand-alone story, entitled 'Flash out Of Water', deals with Flash investigating the sudden murder of his one-time teacher, Doctor Carson, plus how he attempts to bring his killer to justice. There is one slight snag with this situation though. 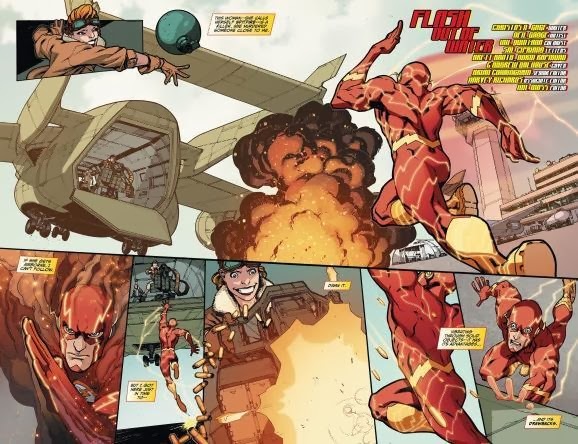 The killer is the known aviator / thief called Spitfire, whom Flash does has some difficulty apprehending, because he doesn't know how to physically pursue her through the skies. Overall I'd say that this issue of 'The Flash' was a very good issue of 'The Flash'. Neil Googe's art was very pithy and expressive, and flowed rather smoothly in relation to Christos Gage's tale. And as for the tale in itself -- yeah -- that was great too. I especially liked how it tackled a single-stranded story-line, and managed to integrate Barry's own origins and level of power, whilst conveying a fairly nifty adventure involving Batman's one time nemesis, Spitfire. Also, another thing about this book I got a right kick out of, was how it asked and answered some of those questions us comic book readers always ask ourselves during a tale? Like, why doesn't Barry call the Justice League if he's in trouble? 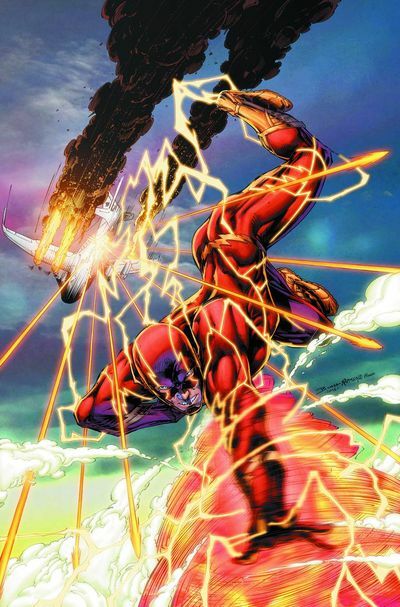 Or, does Barry have the ability to run on air? On occasion I noticed this tale dawdling about with its actual telling. One moment it was set in the present time. The next moment it was set in a flashback sequence. And the moment after that it was set in a character-driven plot-point. Not that this was a major problem, of course. It was a novelistic slanted-story after all. Having said that, though, I honestly feel I would've enjoyed it a lot more, if the central narrative was more clearly defined from one segway to the next. OK. So maybe this is my more satirical side speaking. But I tell you what, pal, as soon as I finished reading this comic book, and saw what Barry actually did in it, for the life of me, I had to hum that breezy yet jazzy tune sung by Frank Sinatra, 'Come Fly with Me'. Go on. Do it for me, baby. Do it for me now. Now if you've taken a good long look at the picture provided, I'm sure you would have guessed that this lovely lady with the silly hat on is the late great Amelia Earhart herself. However, what character from this comic book do you think she inspired the creation of? Could it have been Barry Allen perhaps? Due to the fact he has short hair! Or better yet, why not that Spitfire character! Minus her criminal activities of course, Ha! Yep. You got it in one. It was Spitfire. Both of them adventurous maiden's of the airways. Whhheeeeeeeeee! So how do you like my new comic book format, folks? Go on. Be honest with me. Is it too conventional for you? Do you think it's a marked improvement on what I did previously? Or couldn't you care less about this matter at all? As always, whatever you say -- be it good or bad -- will always be taken on board. But only if it's constructive by nature, otherwise I'd ignore you like I do my lack of sleep. Anyway. This issue of the 'The Flash'. Great, wasn't it? The stand out for me would have to be how Barry actually... coff-coff... nearing the end of the tale. As it just goes to show you that he can do nigh on anything if he puts his mind to it. Furthermore, seeing Spitfire, Christos Gage, and Neil Googe again was a real treat. And for me, this propelled this story more than I thought it originally would. Oh! By the way! Hi Christos! Do you remember me? I was that idiot who talked to you in Greek whilst you were writing 'Stormwatch: PHD'. I'm not sure if you understood me though. You just waved and smiled at whatever I was saying, and was good enough to draw me a picture of Jackson King with his shades on. Hmm? Shades? That reminds me of something. Night-night, folks! Nuff said.